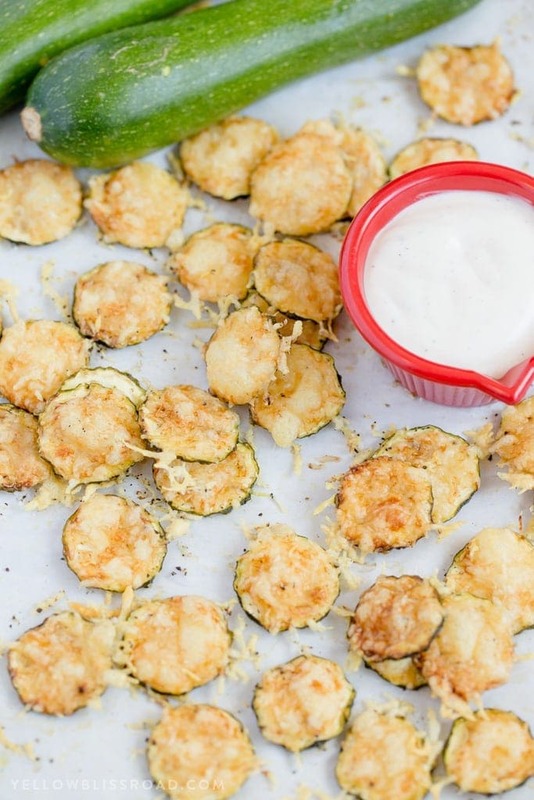 We love using zucchini in our recipes. It’s healthy, adds moisture in place of butter or oil and has a very mild flavor that is great with Italian dishes like Goat Cheese and Marinara Stuffed Zucchini Boats and sweet treats like Double Chocolate Zucchini Muffins and Chocolate Chip Zucchini Oatmeal Cookies. Healthy snacking is kind of an oxymoron isn’t it? I mean, when I’m in the mood for snacking, “healthy” isn’t exactly on my mind. However, I do love me some zucchini and coupled with fresh grated Parmesan I can do healthy snacking thing all the livelong day. When I was a young adult I lived with my grandmother. She’s the one who actually got me addicted to zucchini. Whether it was in her famous Zucchini Bread or in a delicious saute, zucchini was often the vegetable of choice that graced our dinner table. Fried zucchini was her favorite. Not the healthiest of choices but still pretty darn yummy. 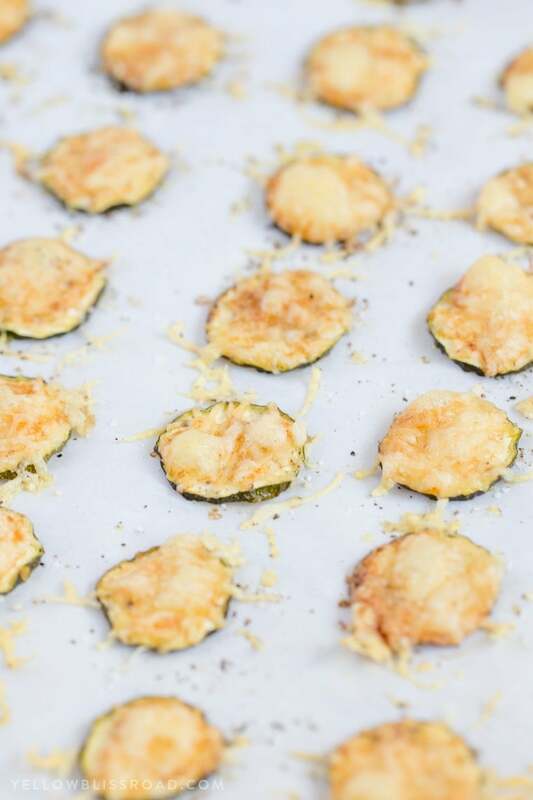 Well, guess what folks – these Parmesan Zucchini Crisps taste like fried zucchini without all that pesky frying! Parmesan is a hard cheese, so it has a lot less moisture then softer cheeses. Bake it on it’s own and it’s going to form a crispy little shell , and bake that shell over some zucchini slice, well, all bets are off! Line a large baking sheet with parchment paper or foil. I’m partial to the parchment for this particular recipe. Slice zucchini into this rounds, no more than a 1/4 inch thick. Use a mandolin if you have one for even slices. 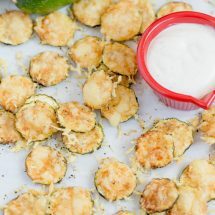 I also recommend laying the zucchini out on a flat surface and pressing them with a paper towel to absorb some of the moisture, resulting in crispier zucchini. 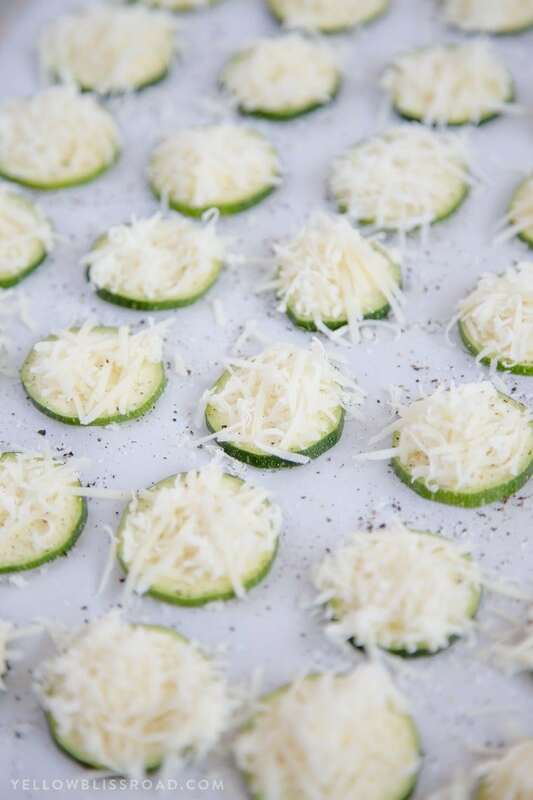 Arrange zucchini in a single layer (not overlapping) onto the lined baking sheet. It’s ok if they are touching as they will shrink up a bit while they bake. 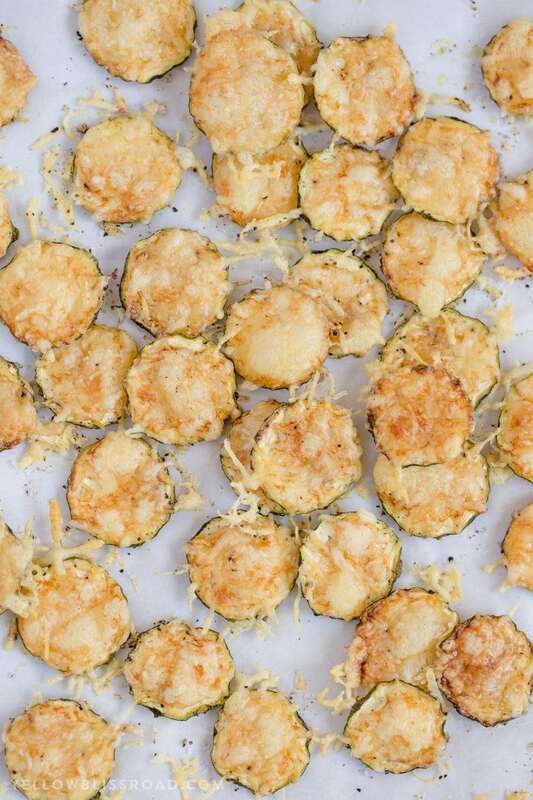 Season the zucchini with salt and pepper and sprinkle with a good amount of freshly shredded Parmesan cheese. Bake until golden and crispy, and let cool for a bit before serving. Of course with a delicious snack like this, you’re going to need something to dip it into. 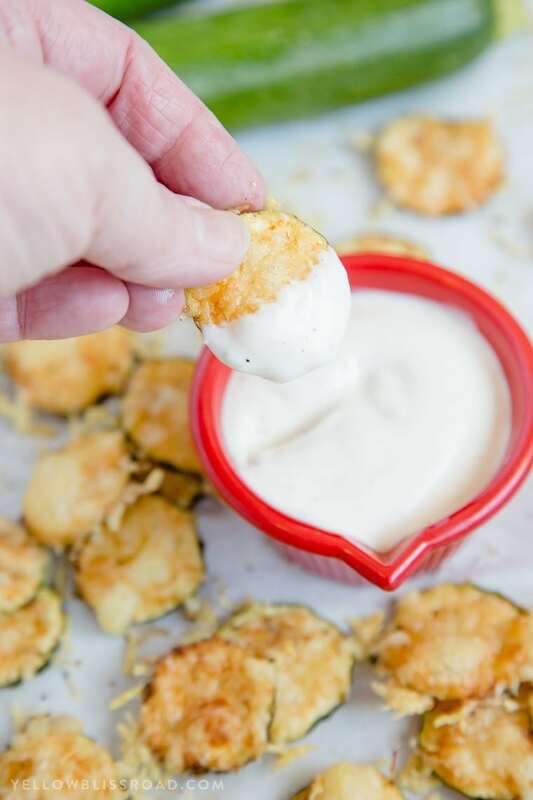 We love using any flavor of Ranch dressing or dip, but blue cheese dressing is also quite delicious. They are super addictive, just like potato chips but way better for you. 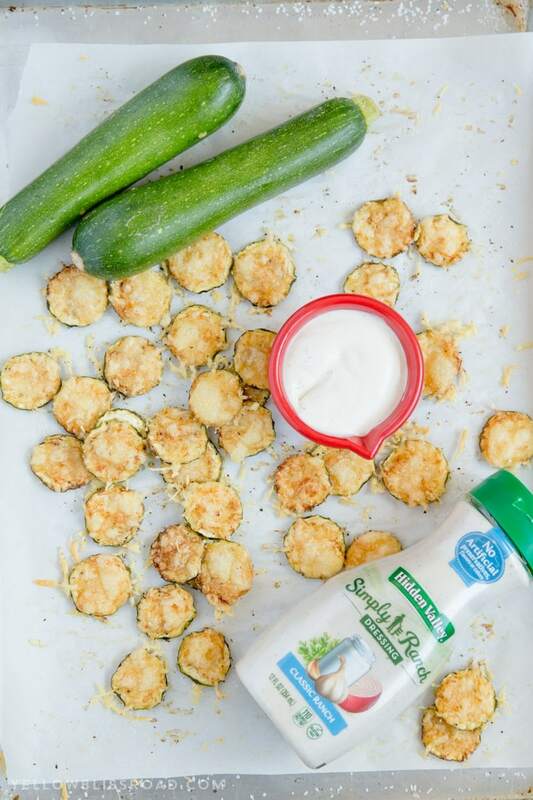 Give these Parmesan Zucchini Crisps a try with some yummy Ranch on the side, and be sure to pick up a bunch of zucchini – they are as addictive as potato chips and your family will be begging you to make this snack every day! Serve with Hidden Valley Simply Ranch for dipping. Didnt crisp up like I had hoped for that chip like crunch..I didnt have parchment paper, I used aluminum foil. Also didnt allow the 20 mins to dry. So maybe those extra steps would be worth it for crispy. They are good though! Thank you for the feedback Amber! Hi” Kristin, the Suchini recipe looks so good and so easy to make, I’m sure be making it for my family. Thank you for taking the time to write this recipes. Thank you Juanita! and thanks for stopping by! Parmesan doesn’t have as much moisture as other cheeses which is why it works best. Hey.. just need a clarification. The picture is shredded Parm Cheese but the recipe calls for grated. Have you done both? whats the difference? Thank you! The term is meant for using a regular cheese grater to grate the Parmesan cheese, rather than using the canned grated variety. In other cheeses, it’s referred to as shredding. Holy moly these are good! Very Delicious, I Love Your Recipes…Thanks For Sharing. Hi Kristin! I saw a few people were commenting that these were not as crispy as expected. I have a coworker who makes these all the time and instead of cooking them on a higher temperature for a short amount of time, she cooks them low (125-200 degrees) for an hour or more, keeping an eye on them for crispness. They come out crispy and perfect every time. Think of it as if you are dehydrating them in the oven. Just a helpful hint that I thought others might want to try! Whenever I decide to make them myself (one of these days) I can let you know how it goes with your recipe! Mine came out soggy, even though I dried them with paper towel. It could be that the zucchini you used just had extra water – it does happen. I hope you’ll try again. I’d suggest trying a smaller zucchini, they tend to have less liquid. Do you have a breakdown of the nutritional facts? I am counting calories but still want these!! This recipe hasn’t been updated with nutritional content but there are lots of free online tools like myfitnesspal.com. Did not come out crisp. Very soggy. What did I do wrong? Did you take the time to dry them a bit? This definitely helps with excess moisture. Hello Kristin Can I use the grated parmesan in the can? Or does it have to be fresh grated parmesan? I only ask because I want to make this tonight but only have the parmesan in the container, not fresh. Please let me know. Thank you! I haven’t tried that but I think you’d be fine. I personally just prefer the fresh grated. I served them right away and they were eaten right away! They will get soggy if stored, so I’d at leave layer paper towels in between. Looks delicious- I can’t wait to try it! But the ingredients say salt and pepper yet the steps don’t mention when to use them/ how much. Are these necessary? 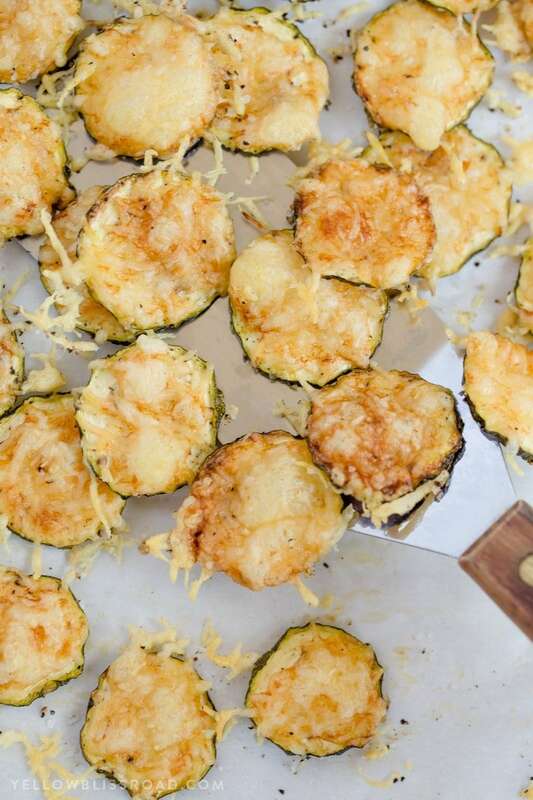 Really you could do this before or after baking, but I prefer to just lightly salt and pepper the zucchini before adding the cheese.